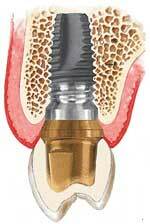 What are Standard Dental Implants? A dental implant is really a very simple metal screw which is designed to thread into the bone of the jaw and to allow for the attachment of a (prosthetic) tooth at the top. Teeth Implants are made of Medical grade Titanium or Titanium Alloy. Your dentist will purchase the implants in sterile packaging and place them in a small hole in the bone which he or she has prepared as part of the implant placement procedure. The bone will fuse to the implant over a short period of time in a process referred to as ‘osseointegration’ and once this process is successfully completed (3 to 6 months) the implant is permanently in place. Strong, durable, and natural in appearance, implants are among the most successful dental procedures performed. Although you have a number of restorative options for the treatment of missing teeth, none has proven to be as functionally effective and esthetically natural as implants. In many cases, dental implants may be the only logical choice for the restoration of all necessary functionality of the teeth and supporting structures. Dental implants are stronger, more durable, and more natural than their restorative counterparts (bridges and dentures). 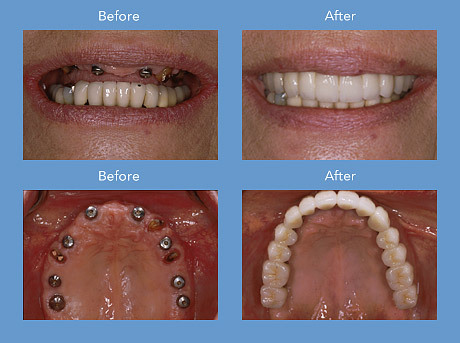 Implants offer a permanent solution to tooth loss. Don’t need to drill into the teeth on either side. Helps prevent bone loss due to tooth removal. The Implant process needs three people; The Surgeon to place the Implant, the Dental technician to make the tooth and the Dentist to connect the tooth to the Implant and oversee the process. The first step is an examination and consultation. This usually involves x-rays and may include taking impressions for models of your teeth. If you have already lost a significant amount of bone, additional x-rays taken at another facility that specializes in this type of x-ray may also be recommended. During the examination, we will be evaluating the area(s) of your mouth where teeth are missing, including the amount of bone available to support the placement of implants. we will also be evaluating the type of replacement teeth that will best meet your needs. A review of your health history will indicate whether there are any medical conditions that could prevent you from being a candidate for implant treatment. The dental implants are placed in the bone using a gentle surgical technique. The Surgeon places a small-diameter hole (pilot hole) at edentulous (where there is no tooth) jaw sites in order to guide the titanium screw that holds a dental implant in place. To avoid damaging vital jaw and face structures like the inferior alveolar nerve and the mandible (lower jaw), a Surgeon must use great skill and expertise. After the initial pilot hole has been drilled into the appropriate jaw site, it is slowly widened to allow for placement of the implant screw. Following this placement, a protective cover screw is placed on top to allow the implant site to heal and the dental implant to anchor (osseointegration). Following the appropriate bone remodeling period, a small connector post called an abutment is attached to each dental implant. The permanent replacement teeth will eventually be attached to the abutments. A series of appointments will be needed to take impressions of your teeth and the implant abutments; place temporary replacement teeth; select the appropriate shade for your replacement teeth and try them for proper fit. In between these appointments, the laboratory technician will fabricate your replacement teeth and the underlying structures that will be attached to the dental implants. Once the above phases are complete, then your new dental implants will be fixed to the abutment and you’ll have a beautiful new set of teeth that look, feel and function just like the real thing. It is possible that implant superstructure may fracture during the implant’s life cycle, and in the event a fracture were to occur, the fractured implant may be removed or left in the jaw if its causing no problem, determined by professional judgment. If the patient keep good oral hygiene and does not return for return for appropriate post-operative care including plaque removal, Implants can fail. The use of tobacco, including cigarette smoking as well as excessive alcohol consumption can cause failure of the dental implants. Swelling, infection, bleeding and/or pain may be associated with any surgical procedure, including Implants and the said conditions may occur during the life of the implants. It is often done under local anesthesia and patients generally experience some discomfort after the procedure although this is usually controlled by paracetamol. It is similar to having a simple tooth extraction. Studies have shown a five-year success rate of 95% for lower jaw implants and 90% for upper jaw implants. Many other studies have shown 5 year success rates in the high nineties. Failure of a dental implant is often related to failure to osseointegrate correctly. A dental implant is considered to be a failure if it is lost, mobile or shows peri-implant (around the implant) bone loss of greater than 1.0 mm in the first year and greater than 0.2mm a year after. Dental implants are not susceptible to dental caries but they can develop a condition called peri-implantitis. This is an inflammatory condition of the mucosa and/or bone around the implant which may result in bone loss and eventual loss of the implant. The condition is usually, but not always, associated with a chronic infection. Peri-implantitis is more likely to occur in heavy smokers, patients with diabetes, patients with poor oral hygiene and cases where the mucosa around the implant is thin. Currently there is no universal agreement on the best treatment for peri-implantitis. The condition and its causes is still poorly understood. Risk of failure is increased in smokers. For this reason teeth implants are frequently placed only after a patient has stopped smoking as the treatment is very expensive. More rarely, an implant may fail because of poor positioning at the time of surgery, or may be overloaded initially causing failure to integrate. If smoking and positioning problems exist prior to implant surgery, clinicians often advise patients that a bridge or partial denture rather than an implant may be a better solution. Failure may also occur independently of the causes outlined above. Implants like any other object suffers from wear and tear. If the teeth implants in question are replacing commonly used teeth, then these may suffer from wear and tear and after years may crack and break up. This is a very rare occurrence, however possible. The only way to minimize the risk of this happening is to visit your dentist for regular reviews. In the majority of cases where an implant fails to integrate with the bone and is rejected by the body the cause is unknown. This may occur in around 5% of cases. To this day we still do not know why bone will integrate with titanium dental implants and why it does not reject the material as a ‘foreign body’. Many theories have been postulated over the last five decades. A recent theory argues that rather than being an active biological tissue response, the integration of bone with an implant is the lack of a negative tissue response. In other word for unknown reasons the usual response of the body to reject foreign objects implanted into it does not function correctly with titanium implants. It has further been postulated that an implant rejection occurs in patients whose bone tissues actually react as they naturally should with the ‘foreign body’ and reject the implant in the same manner that would occur with most other implanted materials. Experienced implantologists have begun to use a new strategy for the replacement of missing teeth. 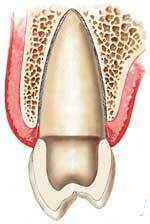 Dental implants are placed into locations where teeth have recently been extracted. When successful, this new strategy can shed months off of the treatment time associated with dental implants because osseointegration is sped up. Candidacy for this type of early intervention is dependant upon anatomical factors of the extracted tooth site. For example, in many cases the extracted tooth site is wider than the implant, making it impossible to place the implant into the site immediately after extraction. Dental work would have to be performed first in order to create a perfect fit for the implant. Another strategy for implant placement within narrow spaces is the incorporation of the mini-implant. Mini-implants may be used for small teeth and incisors. Get more information about alternatives to traditional implants by checking out our mini implant section.